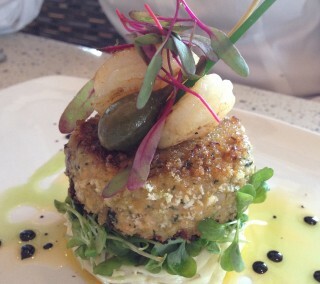 A pretty appetizer of a fish cake with shrimp features a fat dill-flecked cake topped with three shrimp, a toupé of micro greens, and a chive spear. The dining room of the Museum of Civilization has moved and been rechristened. It used to be called Café du Musée and it used to be housed in a separate, administrative building overlooking the River. Now the restaurant is in the museum proper, where the gift shop used to be. It has a less thrilling outlook, over Laurier Avenue, but it is inarguably more accessible, and the new location likely makes a lot more sense in terms of attracting both museum visitors and hungry pedestrians sauntering down the Avenue. In the open kitchen of the new Bistro Boréal is Chef Georges Laurier, whose career on the Gatineau side includes — among other stops — the iconic Café Henry Burger and the lamented Laurier sur Montcalm. My first taste of Bistro Boréal was lunch. And it was an impressive one.